The year is 2030. Viktor Orbán is re-elected in Hungary for the sixth time. All of the leaders from the times when EU institutions were voting to ostracise him are gone. Many are forgotten. At an EU level, he is the prime minister who has attended more EU summits than anyone else, having beaten Jean-Claude Juncker, who attended European Council meetings in two capacities – as prime minister of Luxembourg and as Commission president. The EU has gone through many crises and it has changed, only Orbán hasn’t. At 67, he looks quite fit. The new leaders of other countries wonder how he succeeds to stay at the top for so long. Actually, all of them have helped him. The Hungarian economy is great. Porsche, BMW, but especially Range Rover and Bentley, have moved their businesses to Hungary. Ryanair operates exclusively from Budapest, having closed its hubs in Ireland, Portugal and Belgium, and there have been no strikes since. Since Germany kept its promise and closed all its last nuclear reactor in 2022, it imports quite a lot of energy from Hungary’s Paks 3 and 4 nuclear power plants. Hungarians are becoming rich, and have been investing a lot in real estate in London, especially since the prices went down dramatically after the hard Brexit. Many have tried to copy the Hungarian model, but few have succeeded. Many have tried to copy Belgian surrealism, nobody has succeeded. This is the beauty of Europe: we are so different, so surreal sometimes. The truth remains that Orbán knows how to win elections. In the meantime, decent politicians bite the dust the first or second time they try to be elected. And Orbán gets elected all the time! At least in his country – this fiction doesn’t picture him at the top of an EU institution. But Orbán is changing the EU without seeking to lead it. Back in 2012, he was in Brussels and EURACTIV asked him if he was suggesting that Europe should be “Orbánised”. He then referred to his long history as a politician. “I know what democracy means, I know what political competition is because this is the key to my political success as well. Then you can be sure that when Hungary makes any laboratory progress for the European Union, it is on [the basis of] political competition and democracy,” he said. Europe needs a new vision and new goals, and all true Europeans have to defend EU values in campaigning for next year’s elections and forming a new governance system afterwards, S&D leader Udo Bullmann told EURACTIV. 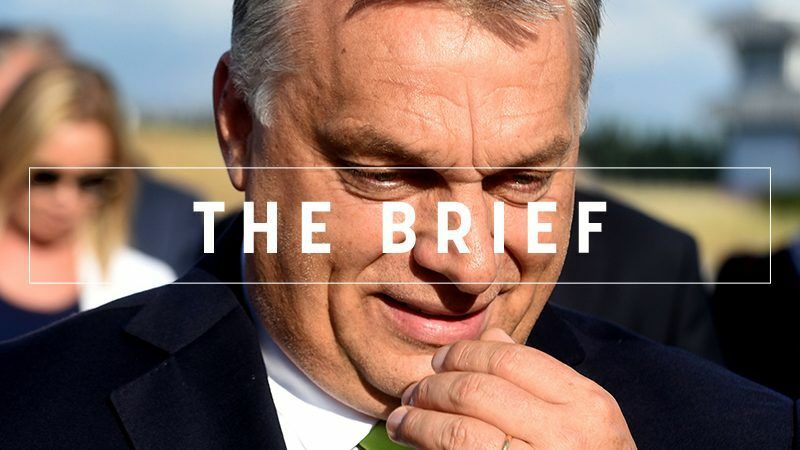 Expecting a crucial vote on Hungary in Strasbourg this week, Giulio Ercolessi writes that more than ever, Europe’s democratic values are under threat and the political developments in Hungary perfectly illustrate that. In his Strasbourg Future of Europe speech, Greek PM Alexis Tsipras told progressive and pro-European parties to join forces against “extreme” neoliberalism and far-right populism. Brace yourself for a November summit! EU leaders are likely to hold a special gathering on Brexit in mid-November when they hope to be able to sign off on a divorce deal with Britain. As Brexit draws nearer, the credo might be “money for peace”. MEPs are demanding that the EU keeps funding projects in the region to preserve peace. Sweden faces a political impasse after its mainstream centre-left and centre-right blocs virtually tied in the Sunday election, while the far-right – which neither wants to deal with – made gains on a hardline anti-immigration platform. Tides might be turning for Nord Stream 2: It won’t be built as planned, a French analyst says, suggesting that Ukraine should decrease its transit fees if it wants to undercut the business case for Russian gas directly to Germany. A French study found that fake news is proliferating, carried by the virality of the internet and the crisis of confidence in democracies. However, nobody manipulates information as well as Russia does. Crunchtime: Commission chief Jean-Claude Juncker will deliver his final State of the Union address to this European Parliament tomorrow. Stay tuned for EURACTIV’s live coverage before, during and after the speech! For those who mentally want to prepare for tomorrow, you can check how you would judge Juncker – from first speech to last.